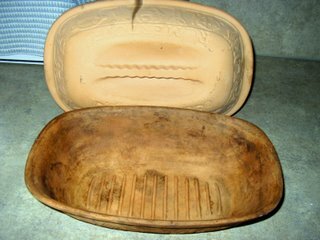 Several years ago my niece gave me a Romertopf Clay Baker for Christmas. To say I was surprised would be an understatement. 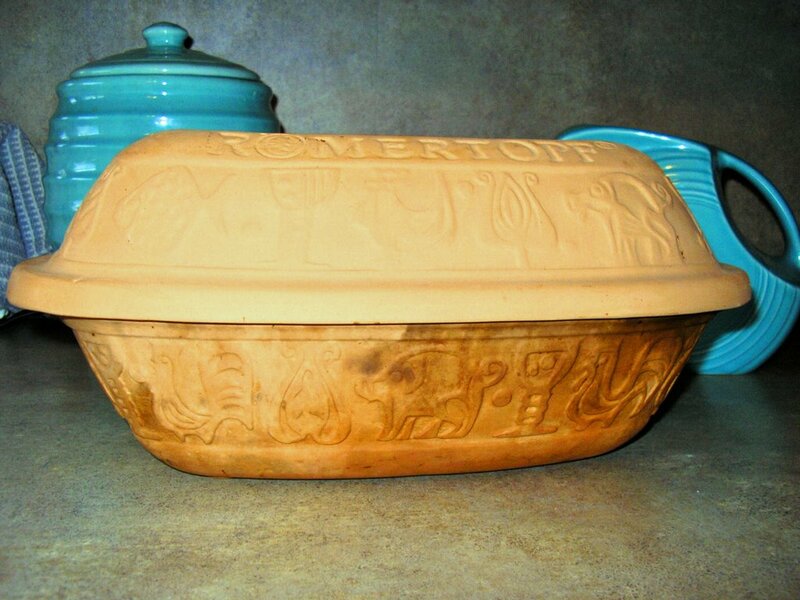 Sure I'd heard of clay pot cooking, but I never, ever thought of actually buying one. But, I thought, what the heck - it's a low-fat, healthy way of cooking, so why not give it a try. 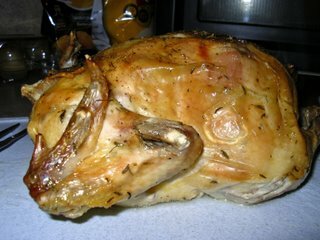 After making my first chicken in it, I've never roasted chicken any other way. As you can see, my clay pot has been used a bunch. In all honesty, chicken is the only thing I make in it even though the recipe brochure that came with it claims you can bake a cake in one. I doubt if a chicken-flavored chocolate cake would be all that yummy. The first time I used the pot the lid cracked (see^^). I was devastated. We really liked that chicken! So I contacted the company and learned that I couldn't get just a replacement lid and would have to buy the whole thing brand new. I thought, forget that - I didn't want the damn thing to begin with! So I just used it with the cracked lid and I haven't noticed any difference in the performance of the pot or the flavor of the bird. And that's it! Easy and delicious. The only hard part is figuring out where to store the darn thing. It is so fragile when it's dry any bump could shatter it. I keep mine wrapped in tea towels at the very top of my cupboard where I have to use a step stool to retrieve it. I've had, and used, mine for years now and I'm certainly glad Cassy thought to give it to me. I know you're not going to run out and buy a clay pot cooker, but if you should get one as a gift some day, thank the giver profusely and use it! I think you'll agree that it is a wonderful way to cook.